This entry was posted in USA USA Immigration and tagged Apply for a US Visa US H-4 Visa USA Immigration usa visa on May 12, 2016 by Blog Author. H-1B visa is actually a non immigrant visa that let employers in the US to provisionally hire overseas professionals in specialty occupations for the period of three years that could be extended upto the period of six years. Family that includes spouse and unmarried kid below the age of 21 can apply for H-4 visa for accompanying H-1B visa holder and they don’t have authorization of doing job under H-4 visa. In order to qualify for H-1B visa, the overseas professional should hold either a bachelor or master degree from university or college in specialty profession. If anyone holding an overseas degree, then that degree should be equivalent to that of the US degree. H-1B visa is made to be utilized for overseas employees in specialty jobs that needs practical and theoretical knowledge. The list of occupation includes engineering, architecture, maths, science, biotechnology, medicine, law, accounts, theology and arts etc. The specialty jobs needs bachelor degree or it’s equal at least. H-1B visa employee should be enrolled for three years. The duration of time might be extended but could not go past six years. Who qualifies for the visa? The education criteria to apply for H-1B visa is that the applicant should hold either bachelor or higher degree should have a year of work experience. 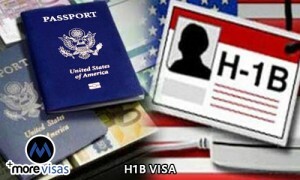 The specialty occupation criteria to apply for H-1B visa is that the requirement of degree for job is common or job is so complex or unique that it could be performed by individual with degree, the employer needs a degree, the nature of the job is specialized and knowledge is needed to perform the job is normally linked with bachelor or higher degree. Initially the employer submit an application for labor certification to labor department, then the employer submit form I-129 to the USCIS, the petitions must be mailed depending on the work location of the H-1B beneficiary as mentioned in the petition, then the potential employees who are residing out of the US apply for visa or enrollment. The petition for H-1B visa (Form I – 129), petition for non immigrant employee should be filed by employers in the US, who might start applying for H-1B visa, six months prior to the actual begin visa data.